Thanksgiving is a peak day for gathering with family and friends. Unfortunately, it’s also the peak day for home cooking fires. Maybe that’s not surprising, considering that the major cause of home fires is cooking—a big part of Thanksgiving activities. In fact, Thanksgiving has three times the average number of home fires involving cooking equipment as all other days of the year. The U.S. Fire Administration offers these tips for a happy and safe Thanksgiving. Stay in the kitchen when you are cooking – frying, broiling or boiling – at high temperatures. Make your cooking area safe. Move things that can burn away from the stove. Turn pot handles toward the back so they can’t be bumped. Watch what you’re cooking. Use a timer when roasting a turkey or baking. Stay awake and alert while you’re cooking. If you see smoke or the grease starts to boil in your pan, turn the burner off. Prevent burns. Wear short sleeves when you cook, or roll them up. Don’t lean over the burner. Use potholders and oven mitts to handle hot cookware. Keep young children at least 3 feet away from the stove, oven or any place where hot food or drink is being prepared or carried. Keep hot foods and liquids away from table and counter edges. 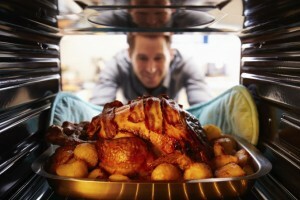 Turkey fryers can easily tip over, spilling hot cooking oil over a large area. An overfilled cooking pot will spill cooking oil when the turkey is put in, and a partially frozen turkey will splatter cooking oil when put in the pot. Even a small amount of cooking oil spilling on a hot burner can cause a large fire. Without thermostat controls, deep fryers can overheat oil to the point of starting a fire. The sides of the cooking pot, lid and pot handles can get dangerously hot. ← How Can People With Disabilities Be Safe While Living Independently?